Awesome Astronomy - Where, oh where is the Great Big Bear? Cultural wasteland – The Old London Planetarium. So here I am, now a father to a budding astro-nut in the shape of a big-bang obsessed, ‘Mars is my favourite pink planet’ almost four year old and while the site of the London Planetarium is a mere 20 minute tube ride away it is many years in the past and theBakerloo Line has no worm-hole. Which is why today I was with my daughter in Greenwich. Up on a hill, looking down on the faded Georgian splendour of Britain’s maritime heritage is the Royal Observatory. This is the home of the Prime Meridian, home of time keeping, spiritual home of British Astronomy and tucked away between the old telescope domes is the Peter Harrison Planetarium. Opened in 2007 this is The London Planetarium reborn. 11am and we are here for “Space Safari” a show aimed specifically at the under 5s. I will admit to being apprehensive. If you are a parent you will know the feeling of dread regarding any sort of educational presentation. “Will it be too advanced? Will it be too dumbed down – or worse – patronising?” My daughter was excitement itself, thedriverless DLR had already started her day well and she could not get me up that hill quick enough for her liking. We got comfy and clutching her ‘space rhino’ (don’t ask) and her copy of ‘Fancy Nancy Sees Stars’ (great book highly recommend!) she began to listen carefully to our Astronomer for the show, Dr Edward Bloomer and she didn’t stop listening to his every word for the next 30 minutes. Entranced by the Space Safari. The show was beautifully simple, involving a teddy bear leaving his bedroom and exploring the Solar System for “The Great Big Bear”, which of course, you may have guessed was Ursa Major. There was music and songs, fantastic narration and questioning by our host and everything was pitched perfectly. My daughter was so taken with it all that when the offer of meeting Dr Bloomer to ask a question was presented, Daddy was left gathering the coats and bags while she interrogated him about craters on Mars. Well done Royal Observatory (the rest of the visit was an equal success) and thank you Dr Bloomer. My daughter was buzzing all day and wanted to stargaze the moment it got dark (defeated by cloud). I hope and I am pretty sure that my daughter will remember her first planetarium visit in three decades time as I do mine. 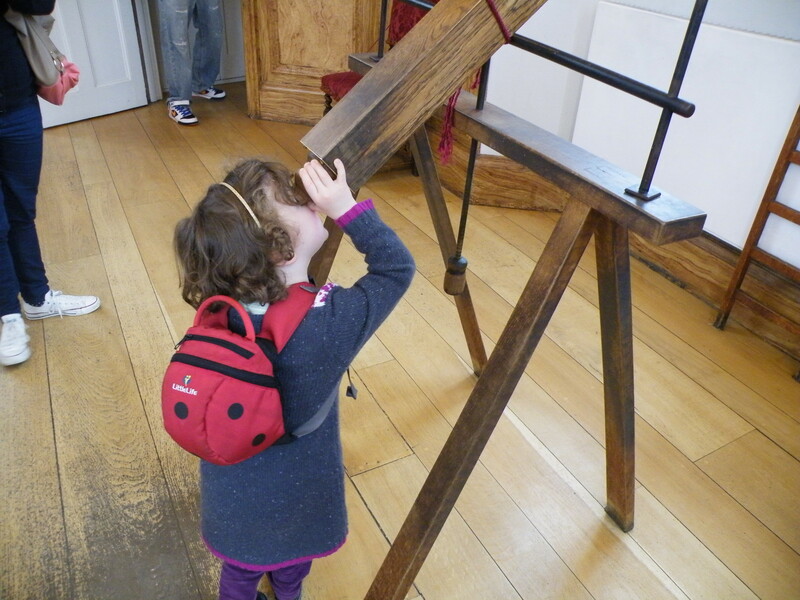 About time we had a woman as Astronomer Royal…. Do visit the Peter Harrison Planetarium and the Royal Observatory. The planetarium has a range of shows and the Royal Observatory has a stated aim of giving the public access to a qualified astronomer and I was delighted to discover that this extended down to even the under-5s.